It is my pleasure to invite you to the 2019 North American Interdistrict Meeting at the Embassy Suites – Hilton, DFW Airport South, Dallas, Texas June 7- 9, 2019. 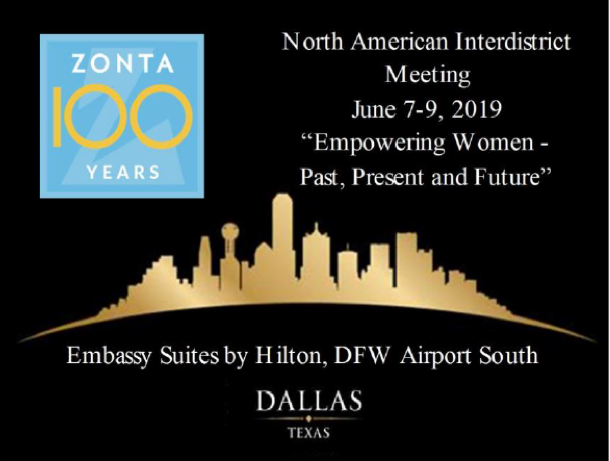 The theme of this year’s meeting is “Empowering Women – Past, Present and Future” in celebration of Zonta’s 100-year anniversary. On Friday morning, June 7 at 9 am, we will present Training Skills for Zonta, recommended for club and district leaders charged with responsibility for training other Zontians. Attendees will receive a certificate upon completion. On Friday afternoon, we are thrilled to invite you to participate in an advocacy workshop, “Ending Early Marriage-a Strategy Session for North America,” from 1:30 to 4 pm. It will be jointly conducted by Fraidy Reiss and Samra Zafar. Fraidy Reiss is the Founder and Executive Director of Unchained At Last, an organization that works to end child marriage in the United States. A survivor of a forced marriage, she dedicated her life to advocating for women and girls. Samra Zafar was a child bride in a forced marriage suffering 10 years of abuse in Canada. She is the founder of Brave Beginnings, a non-profit organization to support abuse survivors in their journey to build a life of respect and freedom. Friday evening will include a buffet and roundtable discussions with experts on various Zonta topics. Saturday will feature a general session, workshops, and lunch and dinner, both with speakers. There will be more workshops on Sunday morning followed by a breakfast croissant and fruit and a recap of all the information presented. International President Susanne von Bassewitz will present our keynote address in conjunction with the International Board. Our president and board will enjoy the NAIDM and then hold an International Board Meeting at the conclusion of the NAIDM in the hotel. This is a superb opportunity for you to talk with Zonta International’s leadership; become more familiar with our biennial goal to end child marriage; learn new information on service and advocacy, leadership and innovation, media and partnerships, and membership and outreach; spend time with Zontians from all over the United States and Canada – and perhaps spend a little time visiting, shopping and touring the Dallas area. See you at NAIDM in Dallas! The site includes our comprehensive program, link to reserve rooms, hotel information and Dallas area attractions. Early registration, through March 15th is $235.00; standard registration from March 16th to May 15thwill cost $250.00, and late registration after May 2nd is $275.00. The registration fee includes the program as well as the Friday night buffet, Saturday lunch and dinner and Sunday light lunch. Hotel rooms will cost $129.00 a night plus fees from June 6 to June 14. The hotel is conveniently located right next to the Dallas Fort Worth Airport and there is a free shuttle available to/from the hotel.